Working behind the reception desk at Birmingham Central Library for 10 years, Rob Joiner has met many memorable characters. Working behind the reception desk at Birmingham Central Library for 10 years, Rob Joiner has met many memorable characters. Now a play inspired by his experiences will feature in a festival. Diane Parkes reports. 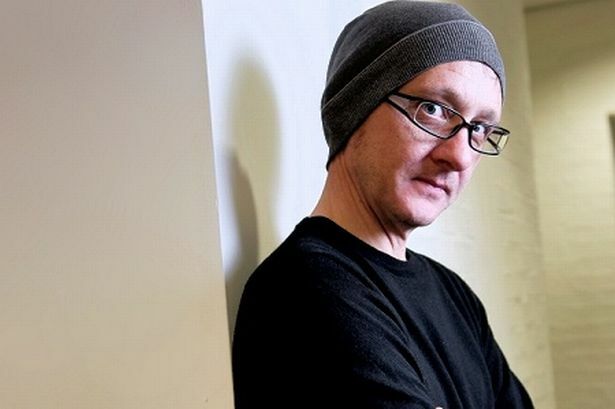 When writer Rob Joiner was creating his play Without a Hand to Hold he turned for inspiration to his job – working in Birmingham’s Central Library. A casual worker as a library assistant for ten years, the 41-year-old, from Tile Cross, has spent hours behind the first floor reception desk, meeting a huge variety of visitors. And over the years they have struck such a chord that he decided to take these passing strangers as the start point for his first staged play Without a Hand to Hold which is performed at mac this weekend as part of the Capital Theatre Festival. “The play is about two guys who share a one-bedroom flat. They have a shared history and the play is about their friendship,” says Rob. “Some people are lucky enough to find someone to go through life with, someone to hold their hand, who is always there for them. But then this play looks at what happens if that friendship is put at risk. “It is very easy to stay in a bubble in life if you are lucky enough to have enough money for food, to pay the bills and to live a life that you are happy with. “But there are people out there who really struggle to pay the rent, have to shop in certain places, have to buy second hand clothes. Because the library is a free service, which is fantastic, you do get a lot of people who come in who exist on the margins of society. “You do see these people coming in the library and I thought these are interesting characters to put on stage because you don’t tend to see them in plays, they don’t tend to have a voice. “One of my characters, Cank, is a night worker who works 12 hour nights as a security guard. I have done those kind of 12 hour shifts so I know what they are like. The other character, Boz, is a porter who works in a hospital. “When you couple these characters with the situation they are in – facing the fact that a relationship you thought would always be there for you may no longer be sustainable – it shows us how some people have to struggle with life. Seeing his play on stage is the culmination of a lifetime’s dream for Rob, who graduated from the University of Birmingham’s highly respected MPhil in Playwriting Studies two years ago. “I had written plays before but I learnt a lot on that course. I always thought it was just about character but you learn how important the structure is. And then you go into rehearsal and you look at every line and you ask ‘is that line doing anything’? “I have always been interested in writing. I remember when I was about nine or ten at Shirestone Primary School and we would try and put together a sketch show called The Funny Half Hour. “Our teachers were really encouraging us to come up with ideas and do sketches. “Then I went to senior school, at Sir Wilfrid Martineau, and put together some sketches and we would burst into assembly guerrilla style and hijack assembly and hold debates and then we would do school plays. “Then at university I did Shakespeare, Leigh, people like that and was then cast in plays. Rob not only wrote Without a Hand to Hold, he also takes the role of Boz alongside actor Matthew Brockington who plays Cank. “It is not easy doing both but it is good to be able to do my own work and I feel that the director Kerry Murdock is bringing out the best in me,” says Rob.” We are exploring a lot in rehearsals. It is interesting going through this process, making a few cuts, looking at how certain aspects work on stage. Without a Hand to Hold is one of three plays chosen by a panel of judges to form the centrepiece of Capital Theatre Festival alongside Calyx by Sean Burn and Cuddles by Joseph Wilde. Rob was delighted to be one of the winners. Rob is keen to see more of his work produced but has no plans to leave the library just yet. Capital Festival director Catherine Edwards says Without a Hand to Hold was chosen from more than 50 competition entries which came from across the UK. The four day festival features performances, workshops, rehearsed readings and networking events and includes input from a range of performing arts organisations including Birmingham Repertory Theatre, Birmingham-based Stan’s Cafe, Talking Birds, Writing West Midlands, Birmingham-based poet Polarbear, Soho Theatre and The Writers’ Guild. “It is important that we find ways to keep writing talent in Birmingham,” says Catherine, who is from Stirchley. “Part of the reason for this festival is to try to think of ways in which we can keep that talent here and provide spaces and opportunities for people to work. And Capital Theatre Festival is gradually expanding. “We ran a smaller festival, a week of rehearsed readings, at The Old Joint Stock in Birmingham two years ago and it was very popular but it was unfunded,” says Catherine. “This time we are hosted and supported by the mac and we have funding from the Arts Council and the Sir Barry Jackson Trust which has allowed us to make it much bigger.